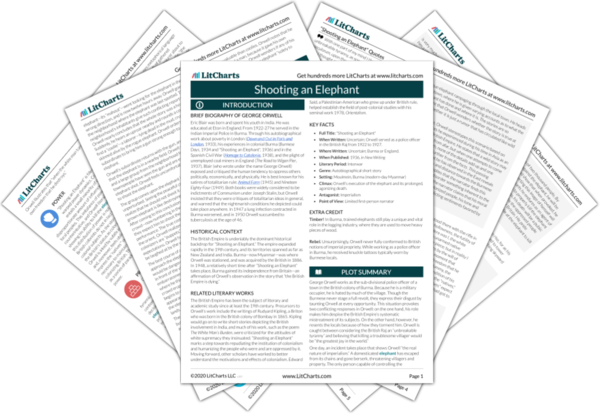 Instant downloads of all 945 LitChart PDFs (including Shooting an Elephant). Welcome to the LitCharts study guide on George Orwell's Shooting an Elephant. Created by the original team behind SparkNotes, LitCharts are the world's best literature guides. A concise biography of George Orwell plus historical and literary context for Shooting an Elephant. A quick-reference summary: Shooting an Elephant on a single page. In-depth summary and analysis of every section of Shooting an Elephant. Visual theme-tracking, too. Explanations, analysis, and visualizations of Shooting an Elephant's themes. Shooting an Elephant's important quotes, sortable by theme, character, or section. Description, analysis, and timelines for Shooting an Elephant's characters. Explanations of Shooting an Elephant's symbols, and tracking of where they appear. An interactive data visualization of Shooting an Elephant's plot and themes. Eric Blair was born and spent his youth in India. He was educated at Eton in England. From 1922-27 he served in the Indian Imperial Police in Burma. Through his autobiographical work about poverty in London (Down and Out in Paris and London, 1933), his experiences in colonial Burma (Burmese Days, 1934 and "Shooting an Elephant", 1936) and in the Spanish Civil War (Homage to Catalonia, 1938), and the plight of unemployed coal miners in England (The Road to Wigan Pier, 1937), Blair (who wrote under the name George Orwell) exposed and critiqued the human tendency to oppress others politically, economically, and physically. He is best known for his satires of totalitarian rule: Animal Farm (1945) and Nineteen Eighty-Four (1949). Both books were widely considered to be indictments of Communism under Joseph Stalin, but Orwell insisted that they were critiques of totalitarian ideas in general, and warned that the nightmarish conditions he depicted could take place anywhere. In 1947 a lung infection contracted in Burma worsened, and in 1950 Orwell succumbed to tuberculosis at the age of 46. 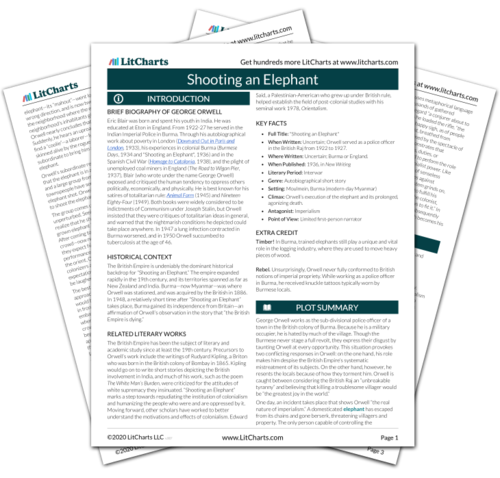 Get the entire Shooting an Elephant LitChart as a printable PDF. The British Empire has been the subject of literary and academic study since at least the 19th century. Precursors to Orwell’s work include the writings of Rudyard Kipling, a Briton who was born in the British colony of Bombay in 1865. Kipling would go on to write short stories depicting the British involvement in India, and much of his work, such as the poem The White Man’s Burden, were criticized for the attitudes of white supremacy they insinuated. “Shooting an Elephant” marks a step towards repudiating the institution of colonialism and humanizing the people who were and are oppressed by it. Moving forward, other scholars have worked to better understand the motivations and effects of colonialism. Edward Said, a Palestinian-American who grew up under British rule, helped establish the field of post-colonial studies with his seminal work 1978, Orientalism. Full Title: "Shooting an Elephant"
When Written: Uncertain; Orwell served as a police officer in the British Raj from 1922 to 1927. Where Written: Uncertain; Burma or England. Climax: Orwell’s execution of the elephant and its prolonged, agonizing death. Timber! In Burma, trained elephants still play a unique and vital role in the logging industry, where they are used to move heavy pieces of wood. Rebel. Unsurprisingly, Orwell never fully conformed to British notions of imperial propriety. While working as a police officer in Burma, he received knuckle tattoos typically worn by Burmese locals. Sobel, Ben. "Shooting an Elephant." LitCharts. LitCharts LLC, 7 Sep 2014. Web. 23 Apr 2019. Sobel, Ben. "Shooting an Elephant." LitCharts LLC, September 7, 2014. Retrieved April 23, 2019. https://www.litcharts.com/lit/shooting-an-elephant.